Mr Sabani was among the artistes who took part in the Italian music spectacle Festivalbar when it was held at the Indepedence Arena in Floriana way back in July 1984. Italy yesterday woke up to the shocking news of the sudden death of one of its most well-known personalities, imitator and television conductor Gigi Sabani. Mr Sabani, who would have turned 55 on October 5, suffered a heart attack on Tuesday night while he was at his sister's house. Born in Rome as Luigi, the showman started off his career as imitator on the radio version of La Corrida, and made his debut on television in 1979 on RaiUno, with a four-minute performance during an event called La Gondola d'oro di Venezia. That short appearance was enough for him to get noticed by veteran presenter Pippo Baudo who enrolled him in RAI's flagship programme Domenica In that same year, and after that, in the Saturday night variety show Fantastico in 1981 and 1982. 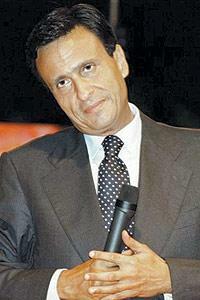 Following his success, he passed on to Mediaset, where he presented Premiatissima and OK Il prezzo è giusto. In 1987 he returned to RAI where he conducted an afternoon show on RaiDue, Chi tiriamo in ballo?, Stasera mi butto in the summer of 1990, and at long last, in 1991, he took the helm of the Sunday afternoon programme Domenica In, where he had debuted 11 years earlier. In 1995 he was back on Mediaset where he hosted the variety show Re per una notte, which saw singers' lookalikes vying against each other. But at this point his career was interrupted abruptly. In the summer of 1996, he was charged with irregularities in show business, together with another presenter, Valerio Merola. But he was found not guilty and was soon released and remunerated for the 13 days he spent under house arrest. The permanently tanned and smiling presenter returned to the small screen in 1999 with the programme Sette per uno, followed by La sai l'ultima? co-hosted by Natalia Estrada, in which participants relate jokes. The last programme he conducted was RAI's noon show I fatti vostri between 2002-2003.